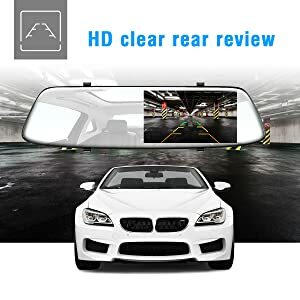 The dual camera dash cam simultaneously or separately capture front and rear view of the vehicle. The front camera record road ahead in 1280*720P and back cam capture behind in 640*480P. The front 170°and rear 140°provide excellent coverage and ensure you get the best footage as much as possible all day. 1.Memory card not included, support up to 64GB SDXC (Class 10 or above), 16GB/32GB Micro SD card Class 10 is recommended. Please format the card monthly and make sure the SD card is in good quality. 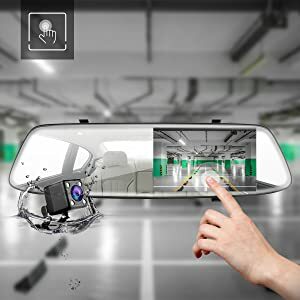 2.Built-in battery capacity is ONLY 150mah, just for urgent use, please keep the Mirror Cam connected to a power source at all times during operation. 3. 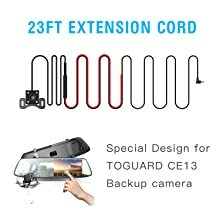 If you are ordering for a VAN or truck you need the extension. please kindly let us know if you need it. 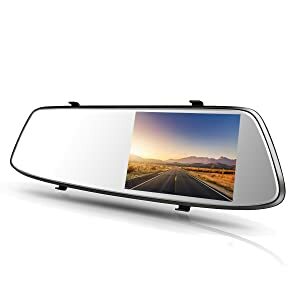 The mirror dash cam will automatically switch to the reversing mode with parking guide line in full view when the R gear is engaged. For One-touch switch design, you can switch the view with 4 display modes,full view front, full view back, half front half back and P-IN P features, just click the P-IN-P button to switch to the pattern as your need. And the front video will ending in "a" folder, rear video will ending in "b" folder. 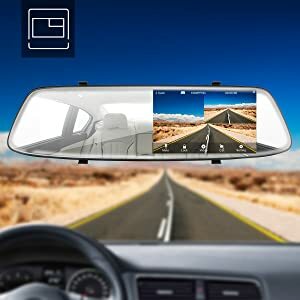 The rear view mirror display will automatically turn off but still keep recording as the screen saver features. And the screen saver time can be set as disabled or 30 seconds, 1 Min, 2 Min etc. 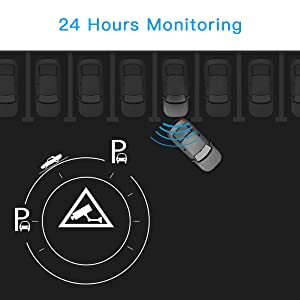 When you back up, screen will automatically turn on, screen saver won`t influence reversing car. 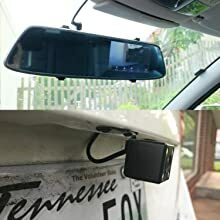 Just simply mount the mirror dash cam over your original car rearview mirror with the 2 included rubber straps. You just need to tie the RED wire into your backup lights (12V). please kindly contact after-sales team if you need installation instructions. 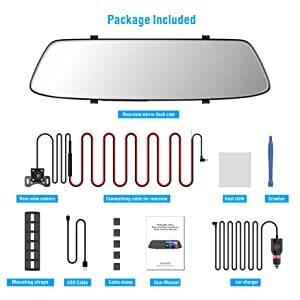 Car length less than 21ft are compatible with this rear view mirror camera. 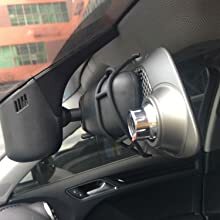 Original car mirror size width less than 10 inch, height less than 3 inch are compatible with this dash cam. 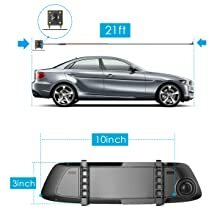 The default rear camera extension cable is 18 feet and can only be used in cars. If your car is pickup truck, please kindly message us to order 23 feet length cord. or search asin B07CYPNV5K on amazon to buy. 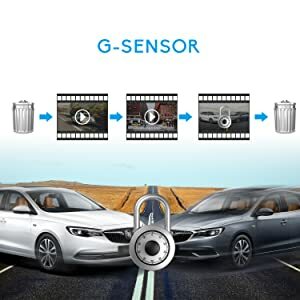 Variable sensitivity G-sensor auto detects a sudden shake/collision and emergency locks the footage to "SOS file" to prevent that video from an overwrite. Gravity-sensor supports sensitivity adjustment.To avoid too many locked file, we suggest you choose " low " option in setting. As to 32GB card, it can recording 1.5 hours for dual recording and 3 hours for front camera recodring only before it loops and start overwrite SD card. 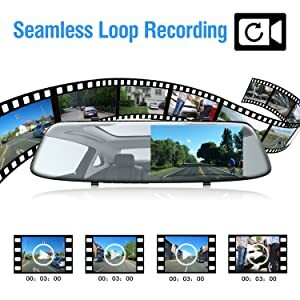 Triggered by the parking monitor, the mirror dash cams will auto start and record a short video then turn off automatically when it detects collision after the car is in parking. What you got in package ?